1. Right-click the SetupCentriQS.zip file and click Extract All. 2. Double-click the SetupServer.msi file and follow the instructions given in the CentriQS Server Setup wizard. Tip You can activate CentriQS during CentriQS Server Setup. Note To install CentriQS server application on your server computer, copy the SetupServer.msi file to your server computer, double-click it, and then follow the instructions given in the CentriQS Server Setup wizard. 3. 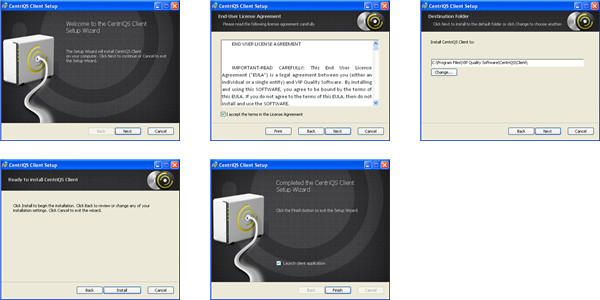 Double-click the SetupClient.msi file and follow the instructions given in the CentriQS Client Setup wizard. Tip If you select the Launch client application check box on the final page of the CentriQS Client Setup wizard, Database Connection wizard will appear and help you log on to the database for the first time. ...Click OK to download and install the latest version of .NET Framework, and then run CentriQS Server or Client installation again.